It’s an interesting play on words – we have a day in our culture set aside to give thanks and call it Thanksgiving. And if we wish to bring more positive energy into our lives it’s helpful to give thanks every day. So perhaps we can contemplate how to bring a sense of thanksgiving into our lives throughout the year rather than focusing on the idea of giving thanks only on one particular day. I heard an interesting challenge on NPR this week that suggested we start considering what we are grateful for from our experiences in 2017 (pleasant or unpleasant) prior to the actual day of Thanksgiving so we are prepared to share our gratitude clearly with our family and friends as we sit down to share a meal. Certainly there are many families that already have a regular ritual of giving thanks with each meal who won’t feel daunted by this task. And for some of us this is not a daily tradition so it may feel like a stretch to feel grateful for the entire year, all in one day! So take it one day at a time, taking time every day – (not necessarily at a meal) perhaps when you first wake up or just prior to going to sleep – to remember something you are grateful for in your life. It might be as simple as feeling gratitude for waking up, or feeling grateful for a warm bed. It might be as complex as having gratitude for a challenging situation that’s providing room and incentive for growth. Whatever your choice is, perhaps set a goal for the remainder of 2017 and the entirety of 2018 to be grateful on a daily basis and then notice how your life acquires a new sense of ease; a sense of things falling into place. Enjoy the practice and have a wonderful Thanksgiving!! Yoga Adobe will be closed on Thanksgiving Day, November 23rd to share time with family and I sincerely hope that you all have a lovely day of sharing and giving thanks with your companions. Do you ever feel foggy, unable to remember where you left your keys, cell phone, wallet? Do you deal with high levels of stress on a regular basis? Did you know that consistently high stress can damage your brain? Yoga practices have the capacity to reduce stress, lower blood pressure and balance mood. There are a variety of tools we can bring into play to assist you in mitigating the effects of stress. Consider not only physical movements or postures (asana), but also breath-work (pranayama), chanting and meditation as avenues to decreased stress and increased inner peace. Yoga Adobe offers a safe space within to approach these practices, check out the website for details on class days and times. See you on the mat. Good Evening! I hope this post finds you well and springing into a lovely, long holiday weekend as we celebrate our independence – not just as a country but as the unique individual that you are. Celebrate your strength, kind nature, and wisdom as you find your personal path of growth. Perhaps that path is through yoga, breathwork, meditation and mantra. If so, join us here at Yoga Adobe as we work our way along the path! Breath deep this weekend, be patient with traffic and with yourself. See you soon. I hope you all have enjoyed our preliminary taste of the Chakras! June will bring us into summer gently with some work integrating these seven energy centers. From that we’ll springboard into different meditations, mudras, asana, breathwork and chanting – along with color therapy and aromatherapy to give you even more tools for personal balance and inner harmony. Have a safe and happy Memorial Day weekend! Namaste. Do feel in control of your emotions, experiencing freedom of mind while fulfilling your goals in life or are you feeling alienated, fearful and lacking motivation? These sets of qualities describe the opposite ends of the energetic spectrum of Sahasrara Chakra – the gateway of the void; the area of divine consciousness waiting to be released. Sahasrara Chakra is located at the crown of your head, the color may be violet, white, gold or silver. The right here is to know and the symbol is the thousand petaled lotus. This week at Yoga Adobe we are focusing our practice on opening the lotus of the crown through mudra, breathwork, a bit of reflexology and, of course, yoga poses to awaken and align our energies. Our aromatherapy oil this week is Frankincense – I will share this lovely aroma with you during your final relaxation to aid you on your journey towards enlightenment! I look forward to seeing you on the mat. Do you ever find yourself doubting your instincts? Can you rationalize anything? Hum, you may benefit from some work to balance your sixth Chakra – Ajna Chakra; otherwise known as the third eye. This energy center is located in the center of your forehead and is commonly represented by either purple or indigo. The element is light rays or all of the elements that lie below the third eye. The function of Ajna Chakra is intuition, self-mastery. When we are balanced in this area we experience clarity, contentment and discernment. You might be a natural healer – someone who is intuitive, insightful or even psychic. Do you know someone who is materialistic, attached to outcome and tends to isolate? These traits can show up when we are unbalanced in Ajna Chakra. You can support yourself in this area through aromatherapy, wearing the color purple, or sipping herbal teas. Try drinking sage tea for vivid dreams or peppermint tea for increased intuition. Come practice with us at Yoga Adobe May 9th through May 12th to experience the asana that support growth in your sixth chakra and perhaps you will emerge with an enhanced sense of connection with your natural instincts and intuition. See you on the mat! The power of the spoken word – it can reflect your truth, your creativity! What happens when you repress your voice? Do you ever notice a stiff neck, sore throat or increased sense of dependency? To support your ability to speak your truth – consider wearing a blue or turquoise scarf, eat light foods such as salads, grapes or yogurt sweetened with honey. You might diffuse some eucalyptus oil in your home or practice Sun Salutations for the throat chakra – Vishudda. Perhaps you’ll enjoy some yoga asana that opens the throat like Camel pose or Upward Facing Plank. Come practice with us at Yoga Adobe May 2nd through May 5th and emerge with an enhanced capacity for clear expression. Welcome to the heart! The seat of compassion, empathy and unconditional love. When we are balanced in this area we enjoy a sense of connection to all living beings that springs from the well of compassion. To bring a greater sense of balance to your heart chakra you might surround yourself with the color green – paint a prominent wall in your home green, burn green candles, eat green apples or grapes, spend time gazing at green grass or green trees, wear green clothing. You might begin or continue posting in a gratitude journal. Padma Mudra is one gesture that brings an enhanced sense of connection to your heart chakra. Meditate on someone you love! Come practice yoga asana, the Padma Mudra and enjoy aromatherapy at Yoga Adobe. We’ll continue our focus on the heart through April 28th. Do you feel a sense of calm strength emanating from deep within? Are you confident and able to express your feelings appropriately? If so, you are potentially well balanced in your solar plexus Chakra – Manipura. Located just above the navel and below the base of your ribcage, Manipura is our center of personal power, energy, self-mastery and will. The color is yellow, the element is fire and one stone that represents this energy is Amber. An essential oil that supports balance in this center is Lavender. If you are unbalanced in this area you may feel timid and unsure on one end of the spectrum or domineering and judgmental at the other extreme. Nurture yourself through yoga or the Vajra Mudra. 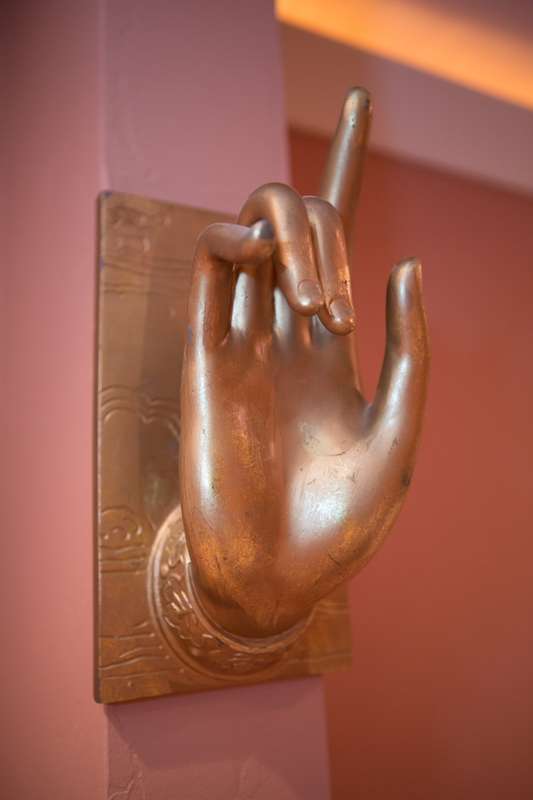 You may enjoy the book “Mudras for Healing and Transformation” by Joseph and Lilian Le Page for more information on using mudras, or you can attend class at Yoga Adobe any time this week for a chance to experience the energy of this mantra with me. You might use a mantra such as this choice taken from “Chakra Workout” by Mary Horsley: “I am loving and appropriately powerful”. We’ll continue our focus on Manipura through April 21st. See you on the mat!